Impressive handling and grip. Improved refinement and ride compared to previous version. Vastly improved by 220 Trophy model on 18-inch Michelin Pilot SuperSports. Lost the raw edge of the old Clio Renaultsport. No manual gearbox option only twin-clutch EDC with paddleshifts. 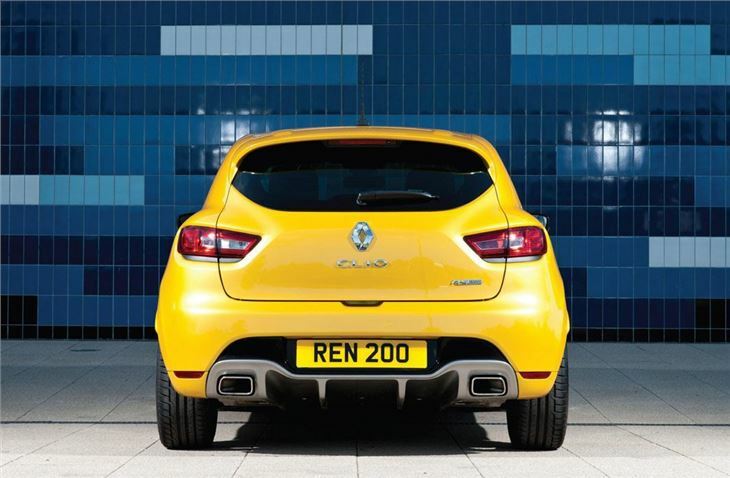 Popular with boy racers and track enthusiasts everywhere, the Clio Renaultsport has established a strong reputation as a fast and fun hot hatch. 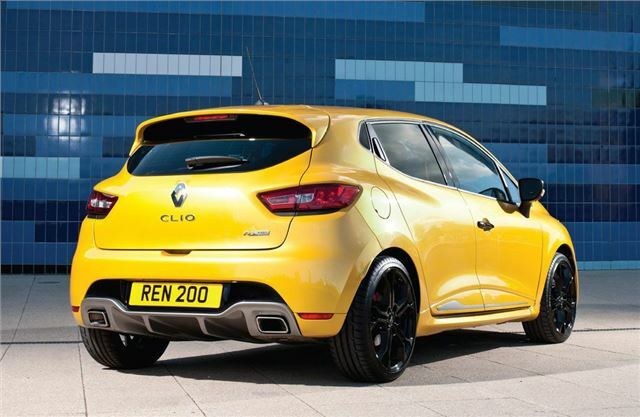 The latest 'hot' Clio incarnation comes in the form of the RS 200, which combines the Clio’s attractive lines with a new turbocharged engine that will cover 0-62mph in 6.7 seconds. 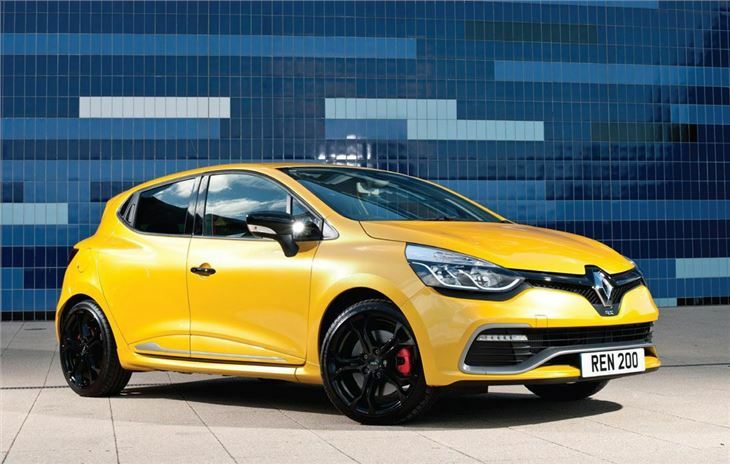 The Clio RS has the same 200PS power output as the old car, but now uses a 1.6-litre turbocharged petrol engine in place of the naturally aspirated 2.0-litre unit. Not only is the new engine lighter and more efficient, but it also has more flexible performance thanks to a 25Nm increase in torque, with a maximum 240Nm available. On the downside, the new engine has lost its throaty character and the introduction of a turbo has made it whispery and quiet in comparison. Another feature that will divide opinion is the transmission. Renault has ditched the manual gearbox in place of a EDC dual-clutch six-speed automatic transmission, with aluminium shift paddles. The decision to remove the manual is a bold one, but the Clio is the worse for it as it never feels boisterous enough to warrant such a supercar style gearchange. 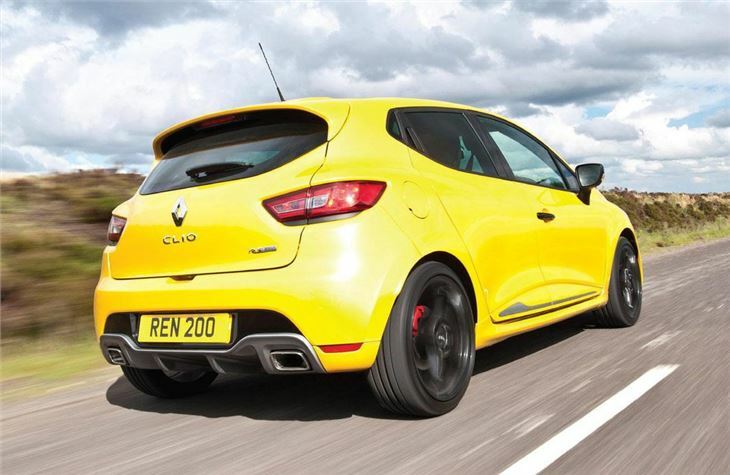 On the plus side, the Clio RS 200 gets a new RS Drive system, with three modes: Normal, Sport and Race. Each mode adapts the engine timing, gear shift pattern, throttle response, steering weight and ESC operation to suit different driving scenarios. 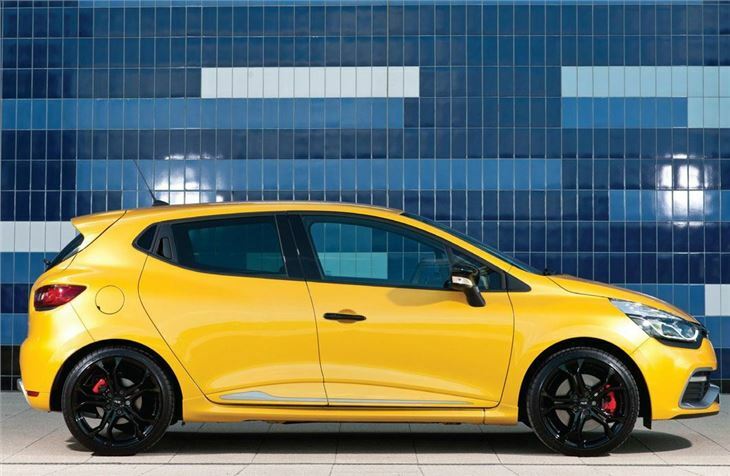 Keen to give its hot hatch 'grown up' appeal, Renault has also revised the interior and diluted its racing overtones, with softer seats and trim. There an integrated touchscreen sat nav, keyless ignition and fully adjustable front seats. There’s no denying that the cabin is better than the old car, but it still lacks the quality and simplicity of its rivals, chiefly the Ford Fiesta ST.
On the road the Clio is entertaining to drive, with plenty of torque and impressive cornering ability. The car also has a better ride for long trips and doesn't crash over potholes and speed bumps like the old car use to. A cup chassis - with stiffer springs and dampers is available as a £650 option for those who want to sharpen the handling. However, even with this, the Clio still feels subdued. 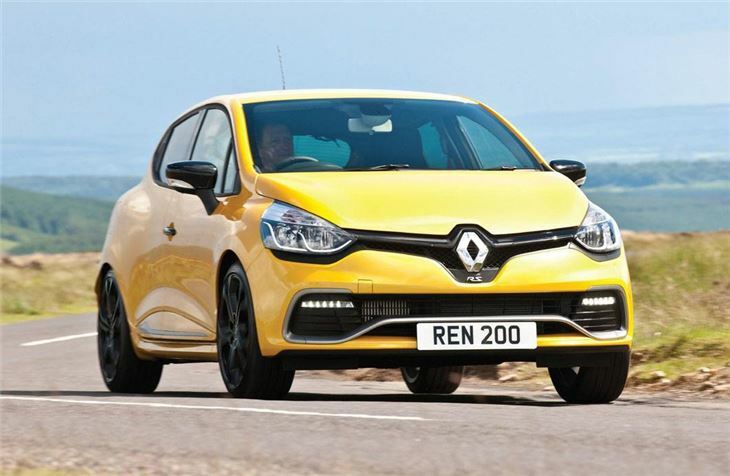 Despite some improvements in the ride and interior, the Clio RS 200 was found to be seriously lacking when it comes to outright performance and enjoyment. On paper, having a hot hatch with supercar style gear changes sounds great, but in practise you get a flat experience of short ratios and too little power. 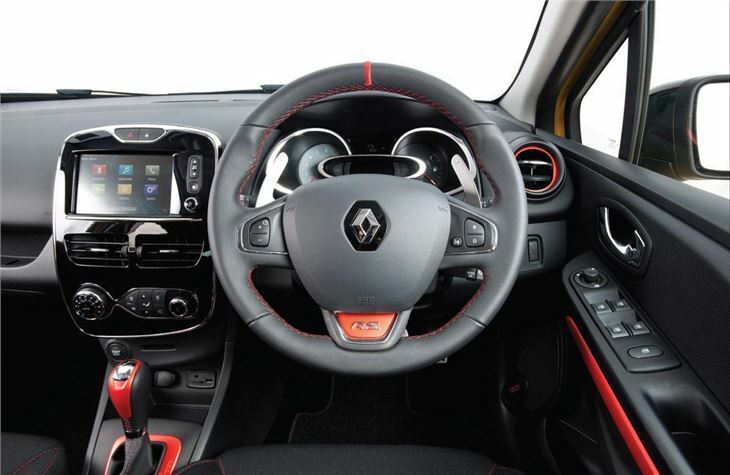 This was later corrected in 2015 with the launch of the much improved Clio RenaultSport 220 Trophy EDC, itself improved again with new features as part of the 2016 Clio revamp.